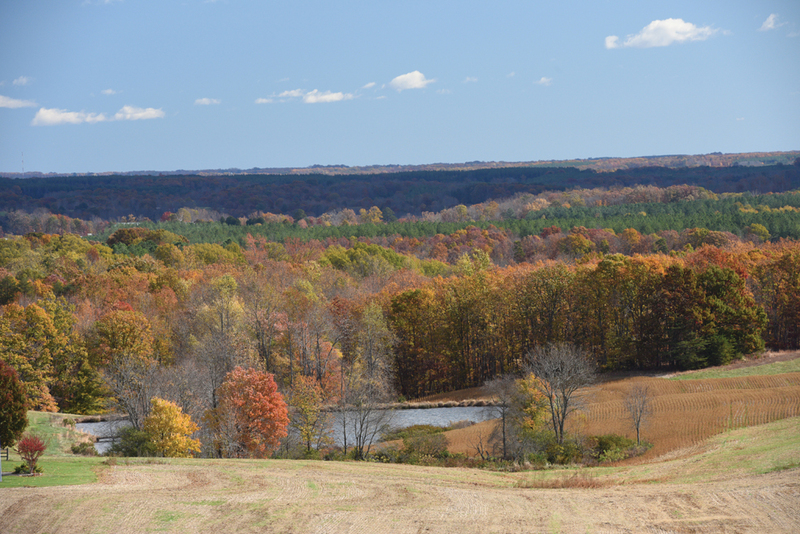 Traveling on twisty roads through rolling farmland, the landscape in Gladys is dotted with four-square farmhouses and newer brick ranches set along fields of crops and cows. But around one particular bend on Bear Creek Road is a house that makes those driving by slow down to take a longer look: placed in the side of a mountain is a new, modern home, but one that obviously has rustic roots. 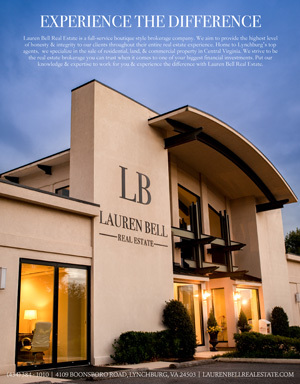 The home, which belongs to Allen and Carrington Bass, is both a nod to the past—built on land that has been in Allen’s family for decades—and the future, both in its modern design and as a place for their own family. Allen bought the land shortly after he graduated from college, knowing he would want his own family to be close to his parents. He dreamed of someday settling down and raising a family across the road from his boyhood home. Then he met Carrington, and knew she was the one. He proposed to her in a small clearing on the property, and the dream started to become a little more concrete. After they married, they began designing their dream house in earnest. They also started a family. Now with two sons, Waylon, 3, and Cash, who will turn 1 in July, they are feeling settled. 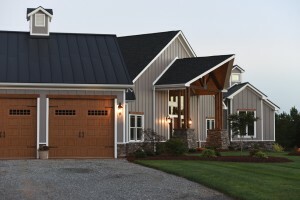 The hardest part of the entire process, they both agree, was finding just the right design for the exterior of the home. Even then, the plan needed to be modified. The original plan encompassed about 10,000 square feet, including quarters for a nanny, which just didn’t fit their lifestyle. They called on one of Allen’s best friends, builder Kevin Pugh, for some help. 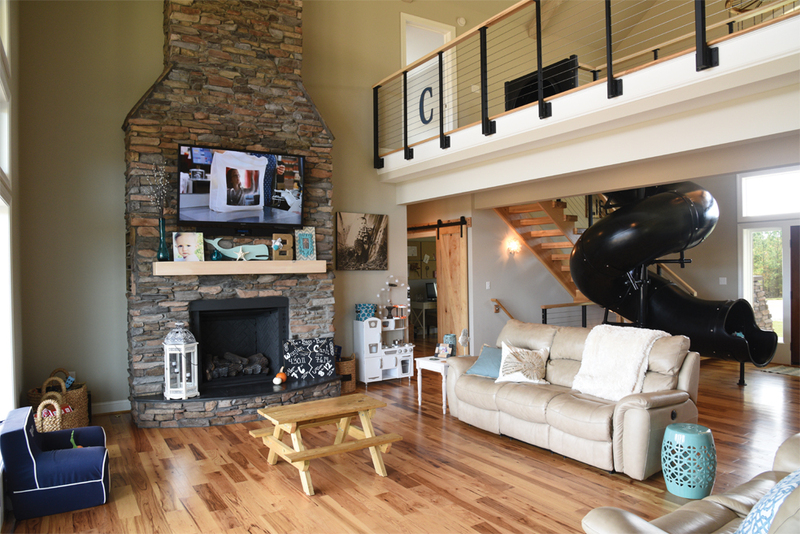 Pugh introduced them to general contractor Keith Smith of Smith Built Construction, and with some advice from Lynchburg structural engineer Randy Parrish, the home started to take shape, literally. 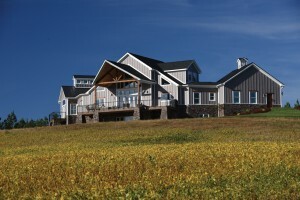 Still, it took 18 months to complete the house, which needed its 6,600 square feet to be positioned just right on the mountainside to allow for a large basement and expansive outdoor spaces on two levels. Once the construction was underway, Carrington turned her attention to the inside. She filled a three-ring binder with design ideas. “I want it to be welcoming, to have our kids grow up here and be happy to grow up here. A fun house, a place where people want to be,” she says. Translating those feelings into a tangible design wasn’t as difficult as Carrington thought it might be. She started, literally, at the front door—with a slide. 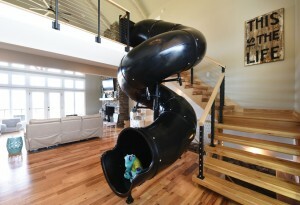 The slide, a twist of black plastic, greets visitors from its position right next to the L-shaped staircase. The family opted for a modern set of stairs, custom built with open treads. And instead of traditional, vertical balusters, the stairs feature horizontal cables between posts. Carrington asked their painter, Jeremy Lethcoe, to add wide, horizontal lines on one foyer wall. Because of the open floor plan, the stripes continue throughout the house and give continuity between not just rooms, but from the first floor to the second floor as well. They also reinforce the look of the linear cables that run through the railing system and the lines created by the hickory hardwood floors throughout the house. 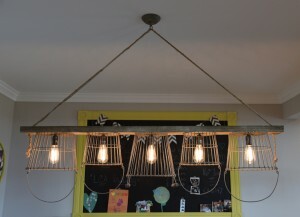 Another request: a custom light fixture in the entryway. Carrington wanted just the right piece, nothing too fancy, but something big enough to fill the space. She opted to incorporate one of her favorite decorating items: vintage Ball mason jars with zinc lids. 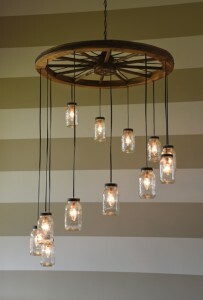 The finished piece uses an antique wagon wheel that holds 12 jars cascading in a downward spiral, mirroring the slide. A powder room is just off the foyer. But visitors rarely hang out by the front door, say the Basses. 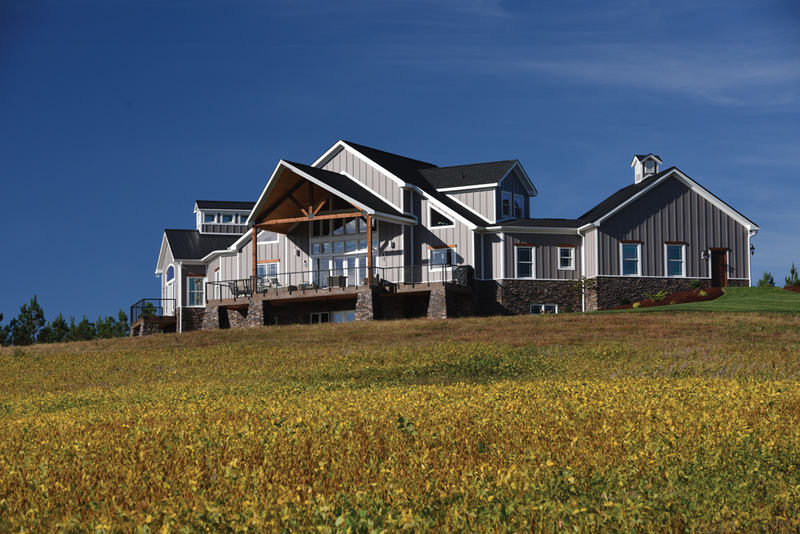 They are drawn almost immediately into the great room, with its expansive windows that show off Campbell County’s rolling hills as far as the eye can see. Carrington says she “grew up in a house that was pretty dark, color-wise,” and knew that she wanted lighter paint colors that would be consistent throughout the house. The home is flooded with natural light, and so variations of cream, soft tan and whispering gray gave Carrington the right neutral palette. Decorating the great room, says Carrington, was intimidating. Finding the right furniture, which had to be comfortable, durable, and neutral enough to blend into the background, proved to be challenging. She was also looking for something that wouldn’t detract from the incredible views. Ultimately, she opted for tan leather sofas, one facing the two-story massive rock chimney and fireplace, and one facing the expanse of windows and doors that open to the second-floor patio. 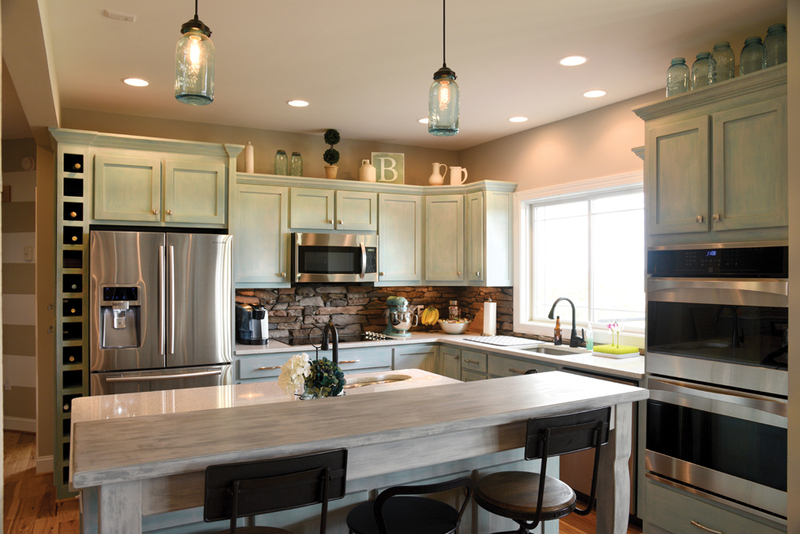 She chose to accent with a light blue with gray undertones, a look that carries into the open kitchen, which sits next to the great room. She took a chalk painting class at Studio Eleven in Lynchburg, and decided to paint her kitchen cabinets with a mixture of Annie Sloan’s Provence and Paris Gray chalk paint. Not only did she avoid “messing up,” but she liked the look so much that she painted all of the home’s custom cabinetry with the easy-to-work-with Annie Sloan chalk paint. The bar overhang in the kitchen is painted in a combination of Graphite and Paris Gray. 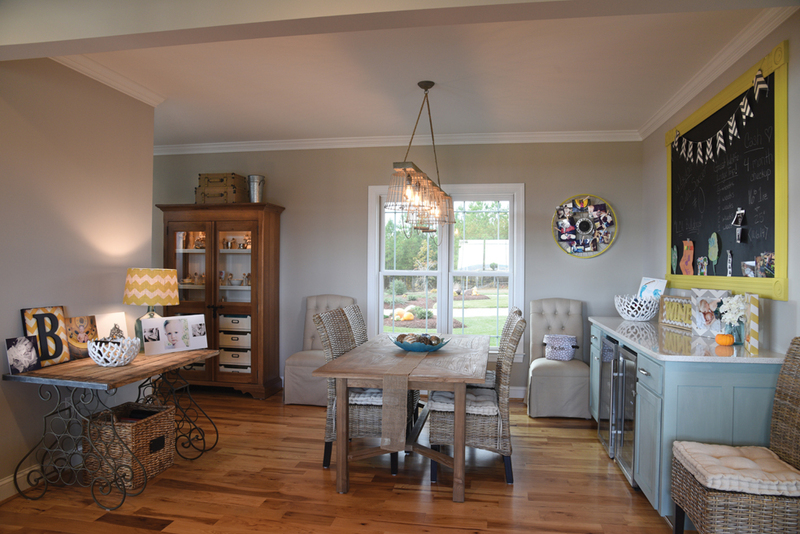 The subtle differences in color help bring cohesion with other spaces throughout the house. She also used pops of blue to provide continuity. 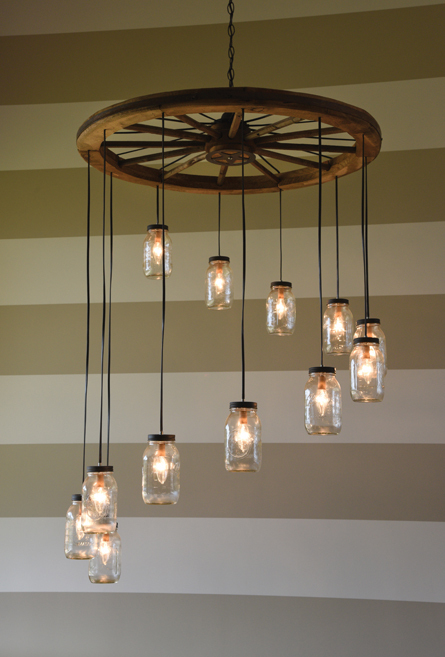 The pendant lights over the island, for example, are made from blue Ball jars. Similar jars line the top of the cabinets and add a touch of whimsy. Carrington also used visually similar materials in different spaces: the look of the stone fireplace, for example, is repeated in the kitchen as a backsplash. And countertops in the kitchen made of white quartz flecked with silver, which came from Spectrum Stone Design in Concord, are also used atop cabinetry throughout the house. The shine adds a modern flare to an otherwise traditional surface. Tucked behind the kitchen is the family’s dining room. A large portion of the wall over a side bar she painted Duck Egg Blue is painted with black chalkboard paint and wrapped in an ornate frame painted in an Annie Sloan color called English Yellow. Carrington says she marks important days there, which could be anything from an upcoming birthday to a winning season in soccer to counting down days until the next vacation. While she enjoys displaying family photos—snapshots are attached to a painted bike wheel mounted on one of the dining room walls—Carrington prefers uncluttered designs. She also has an eye for unique pieces that create an eclectic vibe in an otherwise neutral palette. 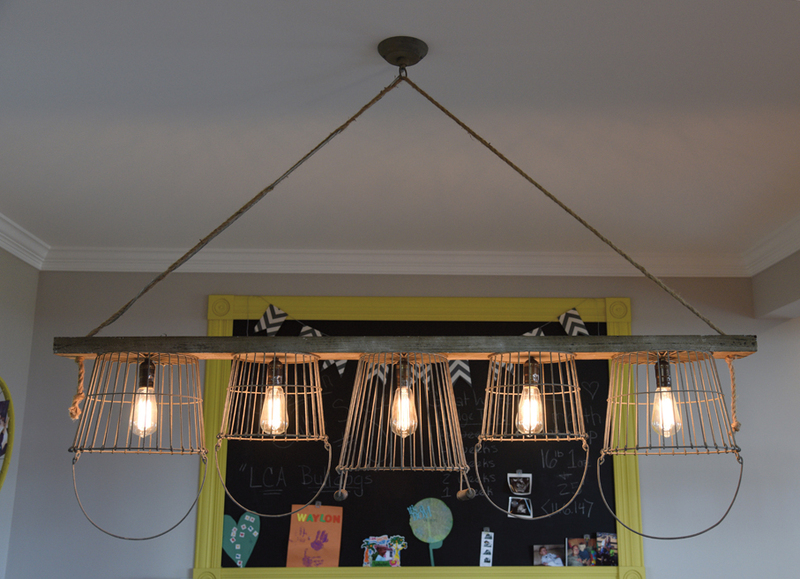 To this end, she spotted a perfect light fixture for the dining room when she was shopping in downtown Lynchburg’s Urban Merchant. Wire baskets in various sizes hang upside-down from a weathered board, the height determined by twine. “It was exactly what I wanted,” she says. The metal and wood add textural contrast to the rattan chairs and table, which can easily seat six. A buffet table is wide enough to hold platters for large family gatherings. Spaces that give Carrington a sense of pride are the working rooms in the house. 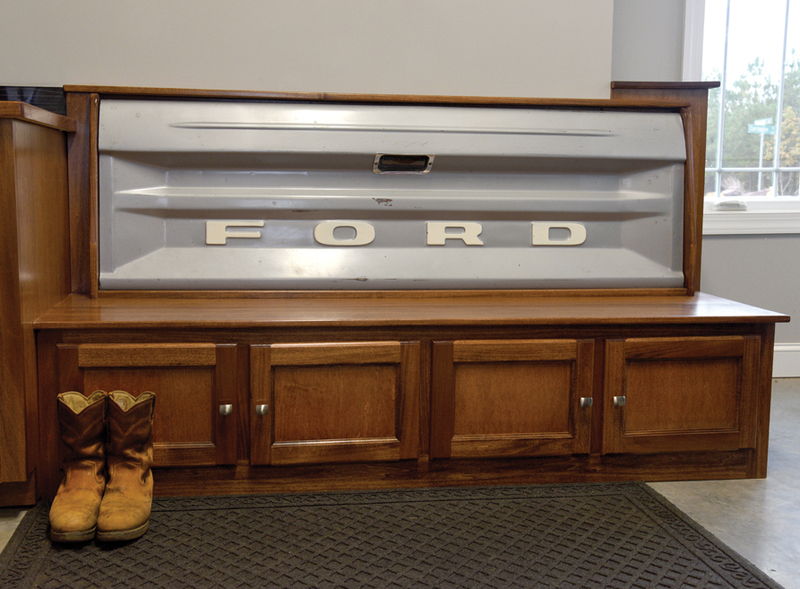 The two-car garage features custom cabinetry that incorporates a vintage Ford tailgate to store boots, hats and coats, along with a sink, so when Allen comes home from work (he owns Bass Sod Farm with his brother), he can clean up a little before coming inside. “When he’s clean, he’s allowed in,” Carrington jokes. Entering the house from the garage, there is mudroom on the left; each family member has a cubby with a hook for a sweater or jacket, along with a basket large enough to hold seasonal items. She painted those Greek Blue. On the other side of the wall is a large laundry room, also organized to eliminate clutter. Each family member has his or her own laundry basket, which can be easily hidden from sight in a deep cabinet. 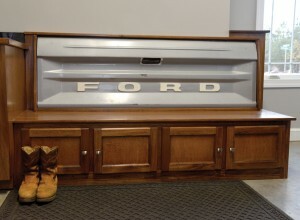 A utility sink and a central vacuum system ensure messes get cleaned up quickly. Across the laundry room is a pantry, with shelves filling what could have been an awkward, angled space, to provide even more storage solutions that keep the household organized. Her office, too, is all about function. Also off of the great room, it’s where she can slide the barn door closed and get some work done. For now, it contains some baby accessories, but it is definitely a woman’s space. Accents of bright, cheerful pink allow Carrington a touch of femininity in a practical space. Across the hallway, a guest room, complete with another full bath, is currently being used as a playroom. Bedrooms for the two boys are upstairs, complemented with a hall bath featuring two vessel sinks, so as they grow, they will have their own spaces. Carrington painted these cabinets a mixture of Napoleonic Blue and Provence. The bedrooms are exactly the same size and shape, each with a triangle window facing the incredible east views, so there won’t be any future bickering about who has the better room. Carrington says she wanted to have rooms the boys could grow into, to resist the urge to “cutesy up” a room for babies or young boys. She opted instead for more traditional-yet-contemporary design elements that will withstand the test of time: bold zigzags, stripes and polka dots. Both rooms also feature a continuation of the horizontal painted stripes from downstairs. Each room has a single letter monogram and a personalized pennant for each boy. She knows there will be more messes and clutter to come, but she has worked hard to devise ways of keeping it hidden. 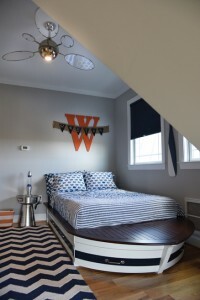 Case in point: Waylon’s bed. Whimsical in its boat design, the hull is actually made up of drawers, eliminating the need for a separate dresser. Both rooms also have large, walk-in closets with built-in shelves to maintain easy organization. The bedrooms are the only room in the house with coverings on the windows. Carrington says she needed to install blinds in their windows so the rooms would be dark enough for the boys to sleep. 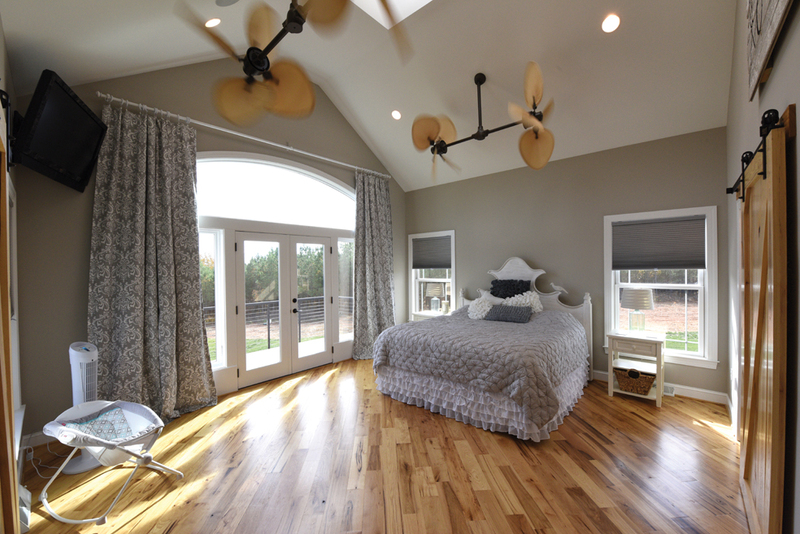 The master bedroom also features blinds; the only drapes in the house are those over the windows and doors to their private balcony. Complete with blackout lining, they were installed to filter out the morning light. It’s a bit of a lost cause, though, laugh both homeowners, because directly over the bed is a cupola with 10 windows. In fact, the cupola was one of the more difficult elements to build, according to Pugh and Smith. It had to be lined up with the roof ridge, so there wouldn’t be any leaks. Here, too, Carrington prefers a less-is-more look, with just a bed, two nightstands and a swivel-mounted TV. Their clothes are kept in their walk-in closets, hidden behind barn doors. Carrington and Allen agree that it’s a room that provides tranquility without distraction. The only piece of hanging artwork is simple and tasteful: “Love” is displayed on aged wooden planks. 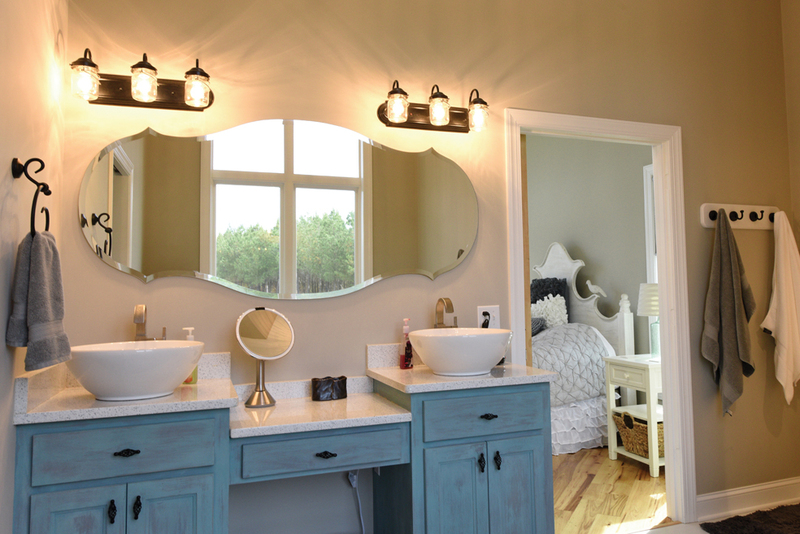 The master bath, too, is designed for relaxation. Here too, two vessel sinks sit atop contemporary quartz, to create individual areas, and, again, Ball jars are used as fixtures. In this room, Carrington, with the help of her mother, painted the cabinetry Graphite and Paris Gray then topped it with Provence. The shower is about more than just getting clean; it is a work of art. With no door, angled walls lead to a large, customized stall with rain showerheads and a hand-held sprayer. A huge window above a large, jetted tub allow for total relaxation while taking in more spectacular views. The homeowners’ attention to detail extends to the home’s exterior as well. Being one of the owners of Bass Sod Farm, Allen saw to it that all of the grass was of the highest quality, lush and deep green. For other landscaping decisions and plantings, he called on Jerry Epps Landscaping in Halifax, and L.K. Carwile & Sons placed rocks made by Innovative Stoneworks around the 10 acres the homeowners cleared off the mountainside. It is a true joy, both homeowners agree, to entertain and spend time in the home’s expansive outdoor spaces. The women, joke Carrington, get to hang out on the upstairs deck, to keep an eye on contained children. To make her point, she notes that the exterior light fixtures are crafted from wine bottles. The downstairs patio lights? Beer bottles. The six massive pillars holding up the patio spaces are wrapped in stone, as is the whole lower level of the house. Allen also insisted on having custom-made “flying gables,” saying he wanted only three things in their house: the cable railing systems, the barn doors inside, and the flying gables. Pugh and Smith said the gables—particularly the one on the east side of the house—were complex. “It’s 26 feet from the subfloor to the ridge,” Pugh explains, so they had to build the gable on the ground, then use a crane to put it into place. We are happy to answer any questions regarding Chalk Paint® and how to customize your home!